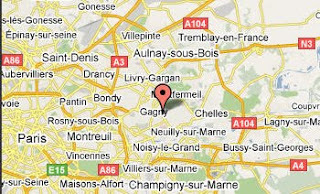 Continuing the tour of the Parisian Netherlands (aka Seine-Saint-Denis), next up, Gagny, the last stop before I re-focus on Paris. 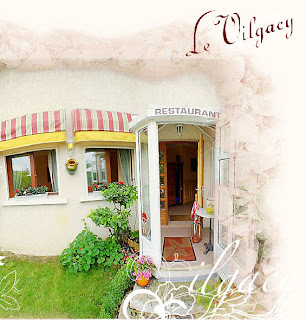 I had eaten at Le Vilgacy once before, a lazy, hazy summer evening about 3 years ago, when it seemed that every other restaurant in the Paris metropolitan area was either closed or sleeping. My memory of that evening is rather dim, but I vaguely remember Co. and I having the place largely to ourselves. Situated on a quiet, residential street—a relatively short stroll from the train station—if it weren’t for the vertical neon “Restaurant” sign out front, you’d half think you were out for a quiet evening at the neighbors. Well, however vague my recollections of that first visit may have been, I do remember that we were surprisingly pleased by the effort made by the chef to add some creativity to traditional French dishes. So when Co. happened to espy Le Vilgacy on a list of Michelin-recommended restaurants in the Paris metro area, we decided it was time for a return visit. Once again, I’m compelled to say that you can’t go very wrong by venturing out to the Paris suburbs for a change of pace, and with its intimate little courtyard in the front, Le Vilgacy could be particularly entrancing once the weather turns warm (unfortunately, that wasn’t possible during our first visit). The recent visit, deep in the throes of a frigid February, found the warm and welcoming interior close to filled. First to the agenda, then to the details about what Le Vilgacy gets right and where it goes wrong. First up, a mise en bouche, which consisted of a medium-sized shot glass filled with a homard mousse and a tiny slice of magret fumé. As per our usual wont, we went with the three-course “menu,” which to our delight, also included a fourth course of cheese (sequentially, course #3, of course). Co. started off with the entreé croustillant de St. Jacques au coulis de poissons rouge, a delicately prepared dish that I would have opted for had Co. not gotten to it first. Instead, to better sample the carte sans redundancy, I went with the uninspired salad buissonniere aux deux magrets. There’s not much you can do with such a dish, which makes me wonder why it was added to the menu in the first place, but it was a change of pace to have two types of duck slices. Prior to the second course, we were provided with a refreshing palate cleansing in the form of a glass of pamplemousse (grapefruit) ice—non-alcoholic, you can’t have everything. For the main dishes, I selected the ballottine de volaille aux ecrevisse, whereas Co. swam with the fishes with her steak d’espadon roti ratatouille au basilic. Once again, I think for originality, Co. had the edge with the swordfish steak and its subtle tomato-basil accompaniment. My surgical attack on the three crawfish lined up in a row in the savory brown sauce that covered the chicken revealed nary a morsel worthy of ingestion—one by one they ended up in Co.’s delicate hands, which always seem to prove to have more shellfish probing potential than my clumsy mitts. Next up, the aforementioned cheese course, and for a ‘menu’ addition, it was pleasing for once to have the entire array brought by tray to the table for perusal, rather than to have the selection made for us (usually that selection will be nothing more than a dab of camenbert and chevre). For dessert, we were seduced by the delice chocolate framboise (me) and bavarois aux peches au caramel chaud (Co.), both amply satifying terminal stops. All of which was washed down by a vibrant 2004 Saumer, Manoir de la Tete Rouge 253, which I strongly recommend (34€). 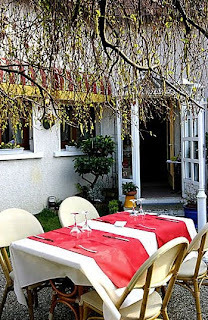 In short, after two visits to Le Vilgacy, I’d have to conclude that the restaurant clearly warrants a trip out to Gagny, with reliably interesting dishes that stray not very far from traditional French cooking. 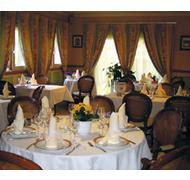 At Le Vilgacy, you also will be warmly welcomed by the owner who, I can assure you, will strike up a conversation with you at your table. That is always nice, to be warmly welcomed in a French restaurant without having the waitstaff treating you as if you have plague and, even healthy, would not be worthy of sharing the same air, much less a table in their restaurant. But this is where Le Vilgacy gets into some trouble, the waitstaff. No, it is not a problem of excess haughtiness, it is that there appears not to be a waitstaff. With two rooms to tend to and one owner doing all the work, the festivities rather quickly slow to a crawl (was that an oxymoron?). A slow crawl. No, a very slow crawl. And with extended conversations at each table, my best suggestion is to take along your copy of War and Peace, which you should be able to knock off rather efficiently between courses. The explanation this time, when I sort of “ahem-ed” in response to the query about whether the service might not have been a tad slow, was that the help hadn’t shown up that night. Curiously, the owner had mentioned that as a constant thorn during our first visit to the restaurant. My suggestion—hire someone competent and reliable. Surely, there’s a “Hiring Restaurant Help for Nuls” tome out there for assistance. Le Vilgacy does a lot of things right—a reasonably priced menu (35€), good quality dishes, warm atmosphere, a couple mise en bouches offered along the way. With the chatty owner, before too long, you find that another table or two have joined your discussion. For our part, it was the implications of the French smoking ban, which according to the owner, has driven some patrons outside for a smoke, left turn to their car, and back on the road. . . without paying! When Co. jealously inquired as to why a couple tables had received a crème bruleé with foie gras (one of her un-guilty pleasures) mis en bouche and we hadn’t (answer: they had ordered an aperatif), it wasn’t long before the owner had brought the tasty tidbit to our table gratis. A bit more courageous experimentation in the kitchen and a waiter or two could propel this restaurant to greater heights. Next up: Yours truly will take Co. for St. Valentine’s dinner (two days before the actual event) for a return to La Dinée, a sure thing, you can bet on it.